Whenever you start checking out a free signal service provider, or any SSP for that matter, you have to understand that free really isn’t free. The most innocent and well meaning of them will still be at heart an affiliate marketer. If you are not familiar with this practice let me spell it out for you. An affiliate is a third party web site that advertised and generates traffic for a broker for a share of the revenue. BinaryOptionBox.com is most definitely an affiliate, how innocent it is a question I am going to try to answer for you here today. What is BinaryOptionBox, it is a “free” SSP claiming to have a 70-80% win rate. 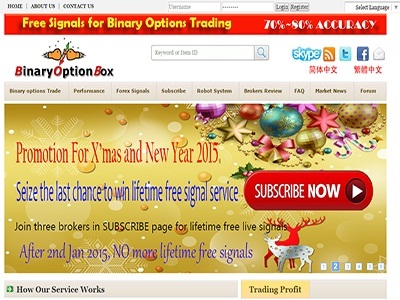 It provides signals on a range of binary and forex binary options that can be delivered to you through Skype or their dedicated trading room. How it works. It’s pretty easy, all you have to do is sign up with one of their recommended brokers and make at least the minimum deposit. Then contact the membership department and they will grant you access to the trading room. This is where I started to find the little things that make me think this service is not so innocent. First, they do offer a free 3 day trial. This is OK, you can check them out but in order to get the full service you will have to sign up with one of their brokers. This isn’t too bad of a requirement, we do want our service providers to make money too but you always have to question their motives. I think this one is more interested in your money than they are in your trading accounts well being. I started to get the feeling this SSP was out for your money early on in my investigation. The deeper I dug the stronger it got. Not only do you have to sign up with their broker to get the full service, you only get it for 1 month. Then you will have to deposit again or else pay the monthly fee of $198. I think this is some shady marketing. Why can’t they just say it out right that it’s a paid monthly service? I don’t mind, I would much rather just pay than get sucked into an affiliate scam. I think the reason they don’t is because they want to maximize their affiliate income before you get washed out of the market using their signals. Let me explain what I mean. In order to get a free month of signals you have to sign up with one of their brokers and deposit money in your account. This will earn them an affiliate fee that can range anywhere from $100 to $350 or more depending on which broker it is, what their affiliate structure is and how much you deposit. Now, each broker has strict rules that protect it from potentially shady traders and organizations seeking to use them as a means of laundering money. These rules include things like each trader is only allowed to open one account. In order to get around this rule they are suggesting you open an account with more than one of their brokers. If you open two accounts you get two months of service and if you open three accounts you get three months of service. This is going to cost you at least 3X the minimum deposition which will likely be $600 or more; it is also going to give them 3 affiliate payouts. The signals provided by this SSP may be OK. The performance reports will certainly make you think so but since we’re talking about real money here you just can’t take what they tell you at face value. It’s is way to easy for them put up what ever trade information they want. Sure, the trades may be real but are they telling you everything? Further, since you are responsible for choosing which sessions to trade, picking which signals to take and then entering them in your account there is no guarantee you will have the same results as them. What happens if you only pick the losing trades? Or only trade when they are having a losing streak? I think it best for new and experienced traders alike to find a better source of trading information than this. As a final note, I just popped over to the FAQ page and got a real laugh. One of the questions was “Can I trust your team?” Of course they said yes. At no time did they describe how the signals were derived.